RIP track - repair in place. Hi Ron. A further reply regarding the NCE Auto switch, having just got out of bed , which means I am fully awake, and now that I have read about this device .Which does make more sense to considering the fact about “ only two wires “ coming from the Powercab. But where does that leave me with the new circuit that you very kindly recommended to me? Can I wire the auto switch in okay. As I know nothing about the Auto switch, only what I have read on the NCE DCC forum, I guess it replaces the manual switch & wiring I suggested. The NCE autoswitch is wired to the main track and program track. Two wires in, 4 out. If it detects a program track signal it cuts power to the main track. Vice versa. Basically an automated DPDT switch to protect against programming on the main when using the program track. Never used one. Although it could be useful as a dead end program track on a siding. A DPDT switch would be a lot cheaper. 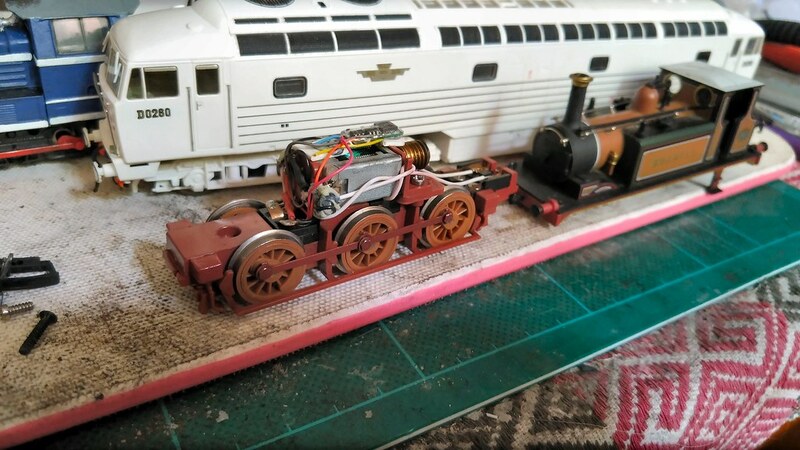 I opened up the last Terrier I converted to DCC to get a couple of photos. Here is Boxhill, an original Dapol model, with its TCS Z2 decoder sitting neatly on top of the motor. Note I have used a couple of blobs of Blu-tack to keep the wires out of the way to ease refitting of the body. Sorry the first photo is a little fuzzy, but it still shows clearly how the decoder sits. Lion sitting behind the Terrier has nothing to do with this topic; it is sitting there because I am about to install a Soundtraxx Econami UK diesel sound decoder and speaker in it. Kevin i would agree do a pug first just to get the hang of it. 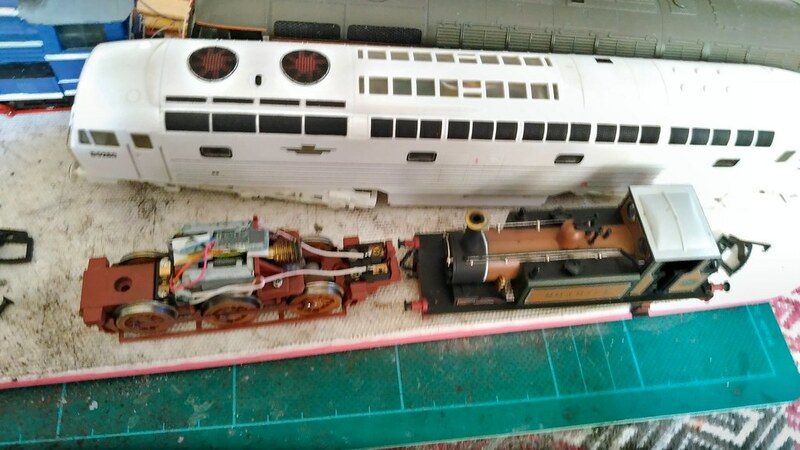 If after doing that you still feel uncomfortable about fitting decoders im sure your local model shop offer a chip fitting service perhaps costing £10-15 a loco that way you will not be getting sleepless nights worrying about fitting decoders.